It is nothing new that disagreements over finances are one of the main reasons couples end up in divorce court. Financial advice is readily available, but married couples are still fighting over money. Why? For a variety of reasons, couples appear not to want to hear financial advice. "Should we create a joint bank account or have separate accounts?" is one of the most important decisions the two of you need to make regarding your finances. Having your own money that you can spend however you want can lessen arguments about money. We disagree with the belief that having separate joint accounts lessens the sense of unity in marriage and shows a lack of trust in one another. It's called a budget. Tracking your spending is not a way to point fingers at one another as to who is spending what. Tracking your spending is not having someone looking over your shoulder every time you buy something. Tracking your spending is critical to being financially secure. Unless you know where your money is going, it is impossible to set financial goals you are both comfortable with. 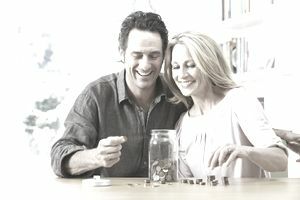 Sure, communicating with your spouse about finances isn't easy because money can symbolize different things to each partner. One may view money as security and the other as power. If the topic of debt, bills, savings, and goals makes one or both of you uncomfortable or defensive, seek the help of a financial counselor or planner. It is important that both of you know where you stand financially and have common financial goals. Couples living month-to-month often rationalize that they just don't have enough money to save. Make the decision to save at least 10% of your income. After saving enough cash as an emergency fund, invest in a retirement account. The earlier the two of you start saving money for your retirement years, the easier it will be have a retirement lifestyle that you both hope for.